Ever wanted to have a black Volga? On Friday and Saturday Finland’s Customs auctions away 128 of the cars used by asylum seekers to enter Lapland from Russia’s Kola Peninsula. “Customs is not responsible for the quality of the cars, the safety and suitability for use,” the Finnish Customs service writes in the invitation to the auction to take place at Salla border checkpoint in northern Finland. Last winter, a wave of asylum seekers, both refuges and other migrants, came across the border from Russia. In the start, most arrived on bicycles, but as Finnish border authorities put a ban on bicycling on icy roads, creative “business-men” started to sell old cars to migrants. Many of the cars hardly made it the 200 kilometres from the Russian town of Kandalaksha to the border at Salla. In January and February, more than 1,000 migrants crossed the border checkpoints of Raja-Jooseppi and Salla. Like on Russia’s border to Norway at Borisoglebsk / Storskog, the migrant flow suddenly stopped from one day to the other. Then, 128 vehicles were left at the border. All cars now up for sale are listed in an overview made public by the Customs service. The majority are Lada of the 2100-series, but also several Lada Samara and Ladas of the 110-series and a few Lada station wagons. More “exclusive” is likely the GAZ-Volgas to be auctioned away. Of the 14 Volga cars parked at Salla, three are in black, known as the Soviet officials’ classic means of transportation. There are also non-Russian cars at Salla, including old Volvo, VW, Opel and a Saab. A few mini-vans are also available. Although most of the cars for the auction are in a very bad shape, rusty, flat ties and broken lights, the interest of buying the migrants’ cars could be high. 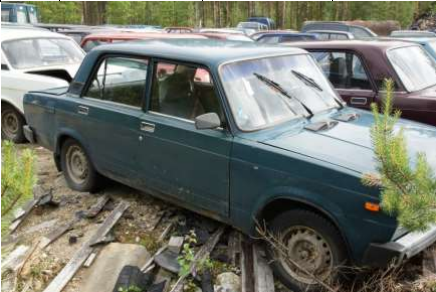 Especially Ladas are popular in Finland, and the cars at Salla border checkpoint are a great cheap possibility to obtain spare parts. No starting prices are listed in the Customs cataloge, but be prepared to add 24% tax to the final price.